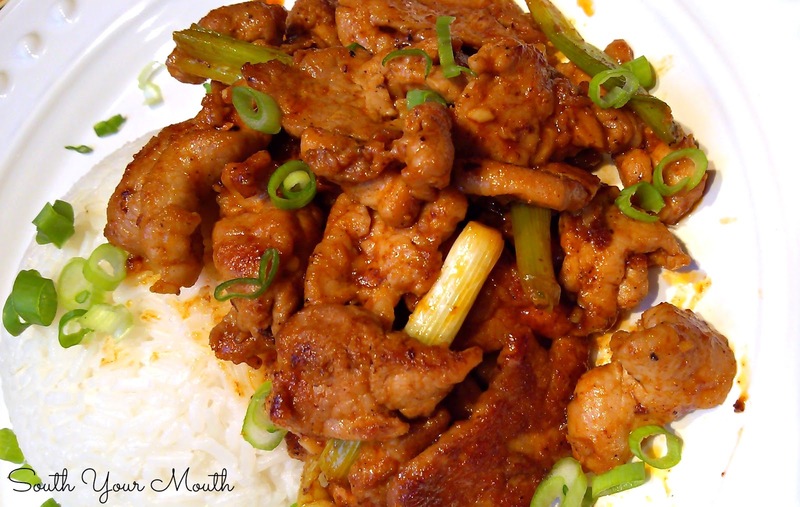 Spicy strips of pork with sriracha, ginger, garlic and onions just like my favorite Korean restaurant makes! Each time I was pregnant, Husband not only had sympathy pains (really, he did, it was touching that we were so connected but even more amazing because he hurt too – mwahahahaaaaa sucka, feel the pain!) but he had sympathy cravings too. I’m so not making this up. He once looked at me at 9:30 at night and said, “Oh my God, are you craving chocolate cake?” I was. After a while he grabbed his keys, headed for the door and said, “I’m going to the grocery store for chocolate cake. I can’t take this.” Haha! Husband is not a big eater. And he never goes anywhere once we've settled in for the evening. So for him to load up and go off in search of cake on a Tuesday night is pretty hilarious. The night Brutus was born, we were just getting settled into the recovery room (or whatever they call the room you stay in until they send you home) and he says, “I want Spicy Pork so bad.” Which was exactly what I was craving. So he left the hospital and drove all the way downtown to the little Korean place that sells the best spicy pork ever. oh, yes you can! If I can, so can you! We rarely go out to eat. And when we do, we always have the onions with us so the hip little Korean place downtown just off campus isn't exactly where we’d go anymore. 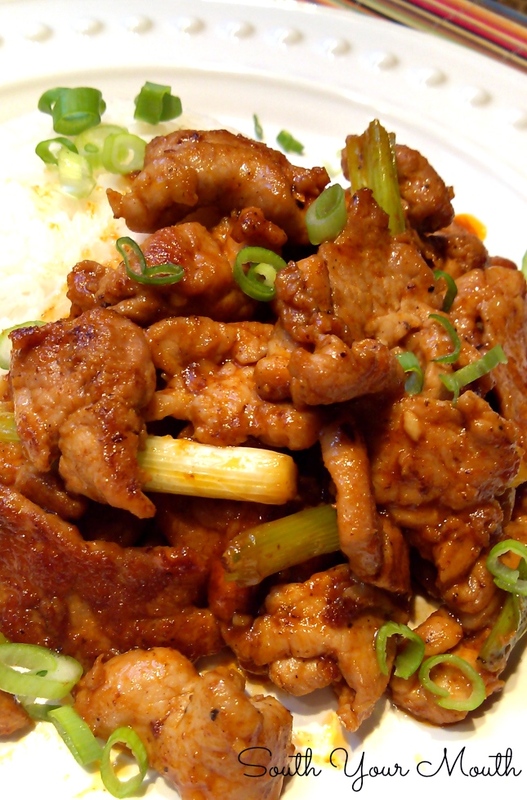 And that’s the only place around here you can get spicy pork (at least like they make it). I was just curious to see if it was something I could even attempt to make so I searched online for recipes. There are plenty out there but most of them require way too many ingredients I don’t keep on-hand. And I just don’t want to spend a fortune on ingredients I’m not likely to use again. So, I kept digging and reading and finally hashed out a recipe I thought would work. I knew it wouldn't be exactly like the real deal but I hoped it would be close enough. And y’all. Y’ALL! I really can’t even begin to tell you how good this is! We ate ALL. OF. IT. Aside from the small serving I gave AB, Husband and I devoured an entire 1.33-lb. pork tenderloin in one setting and were looking for more. I will absolutely double this next time. Which will likely be tomorrow. Because I want more already! As the name implies, this is spicy. I didn't give any to Brutus because he was already turning his nose up at it. I gave AB a little so she could try it and expected her to find it too spicy but she didn't. She gobbled hers all up too. The only thing she said about it was that you better have something to drink with you when you eat it! Cut tenderloin in half lengthwise (to make 2 long strips). Cut each strip as thinly as you can so that you end up with thin little pieces of pork. Add pieces to a medium bowl; set aside. Chop green onions into 2-inch pieces, reserving ends to be chopped as garnish later. 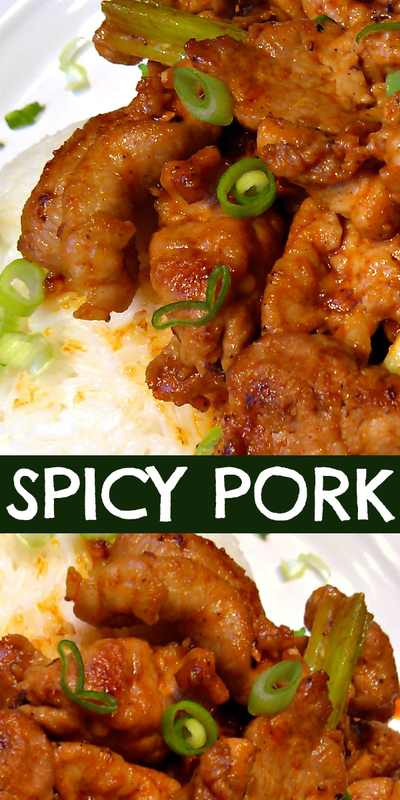 Add onion pieces, 1 tablespoon each sriracha and soy sauce, pepper and salt to pork and stir to combine. Marinate pork and onions for 2-8 hours. Meanwhile, combine sauce ingredients and stir well; set aside. Add just enough oil to coat the bottom of a very large non-stick skillet or wok and heat over high heat. Once skillet is hot, add half of the pork and onions in a single layer (cook in batches to ensure the pork cooks correctly). Cook for 3-5 minutes, stirring frequently, or until pieces are nicely browned and starting to crisp. Remove to a bowl or plate and continue cooking the rest of the pork and onions. Once all the pork is browned, return to skillet, reduce heat to medium, add the sauce and stir to coat. Continue cooking for 3-4 minutes or until sauce is thickened. Serve with white rice and garnish with fresh chopped green onions. This cooks quickly so make sure your rice is done or almost done before you start cooking the pork. Consider doubling the sauce recipe if you like a lot of sauce or plan on having this over rice. I think this would also be amazeballs in lettuce wraps! This Spicy Pork would be amazing to serve with egg rolls, steamed broccoli, sticky rice or a batch of these homemade Pork Dumplings! Okay, that's it. I'm totally making this very soon! I'm always looking for more pork recipes. Plus, my husband is majorly in love with Korean food and wants to move into the little Korean Taco place that's down the street. Pinning! I made this last night and it was SO GOOD!! A tad hotter than I thought it would be, so next time I think I'll cut back on the sriracha a tad, but I will definitely be making it again!! Hub loved it too!! What BBQ sauce do you recommend using? I'm partial to Kansas City red sauces but have used honey bbq as well. I can't say that I have a favorite brand, though. Any red sauce will work. An excellent recipe, thank you! We loved it! YUM!!! I just made this dish today, and it was amazing!!! I also added some pieces of pineapple to give a sweet/ sour taste. My family loved it! Tried this for dinner tonight and it was DELISH!!! So spicy!! My family LOVES this. We have it with pineapple rice - delicious! I made this and oh my! It's delicious! This is definitely going to be a regular recipe for my family! I make this monthly for my son who loves it. We make it into lettace wraps with rice, sliced cabbage, carrots and green onions. My son even adds chili paste to his which increases the heat. It's wonderful! Thank you so much for the recipe. I made this last night and it was the best recipe I've found on Pinterest. I made a couple of changes though. First, for the sauce i added 1 tbsp of asian chili sauce and reduced the sriracha amount accordingly. Secondly, I added and entire sliced Napa Cabbage. I added the sliced cabbage to my empty wok just after I finished stir frying the pork. I stir fried it for a couple of minutes before I added the sauce and the beef. Cant wait to make this again. It would taste more like the Korean restaurant if you used Gochujang (Korean red pepper paste which Walmart carries) instead of Sriracha! My husband and I and our 11 year old grandson loved this recipe. I cut back a little bit on the sriracha and it was perfectly spicy for us. Made roasted broccoli on the side and served the pork over rice. Sooooo good!! Thank you. BEWARE!!! This recipe is NOT gluten free as it is labeled. If cooked as is, soy sauce has wheat and is not gluten free. To make this recipe gluten free you must replace the soy with tamari. Please remove the gluten free designation or make a note in the recipe. Really great recipe, only marinated for about 25 min. and still full of flavour. A little heavy on salt for us though so won't be adding in the mentioned salt and probably less soya sauce.